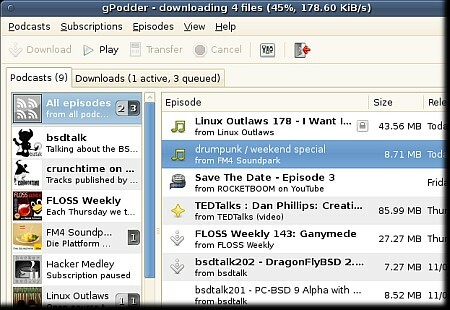 gPodder 3.10.7 Portable » TopFreeSoft.Net - Best Freeware Software! Click the Updating tab to see gPodder? ?™s options for updating feeds and downloading new episodes. Update interval: Drag this slider to choose the frequency that gPodder checks your feeds for new podcast episodes. This time period can be between 10 minutes and 12 hours. If you drag the slider all the way to the left, gPodder will not check for new podcasts automatically, and you will have to update them yourself. Maximum number of episodes per podcast: Use this spin box to set the maximum number of episodes that gPodder keeps in each podcast feed. Once this maximum is reached, gPodder deletes the oldest episodes in the feed as new ones are added. Flattr is a microdonation system that allows you to fund online content creators. You pay a small monthly fee (set by yourself), and it is shared between all the online resources you ???flattr,??? or choose to support. Click the Flattr tab to see gPodder? ?™s options for Flattr. Before you can synchronise podcasts to your media player, you should ensure that the player has been set up properly in the ???Device? ?™ tab. To initiate a sync, select ?? ?Sync to Device? ?™ from the ???Extras? ?™ menu. If you have the ?? ?Create Playlists on device? ?™ option enabled, the m3u playlists will be written to your device and then the episodes will be copied over. If you wish to keep an episode around you may archive it by right-clicking on the episode and selecting ???Archive???. The episode must be downloaded for the ???Archive??? option to show. Once an episode has been archived, gPodder will do its best to never delete it: If auto-cleaning is enabled, archived episdoes will not be cleaned. When selecting multiple episodes, deleting the selected episodes will (should) keep any archived ones.